Making websites kid-friendly isn’t just about having splashy colors on your website. A great kids’ website is easy to read, simple to navigate and makes sure users have fun while visiting your website. So it doesn’t matter if you’re making a tiny kids blog or you’re creating the next expedia.com, the rules for making a really good kids website are the same for making a good website in general. Remember to always look for a voucher when setting up your website, check out www.discountgo.co.uk for up to date codes that can save you a fair bit on hosting services. There are many different kinds of websites oriented towards children: it could be about toys, games, or even learning websites to help children get used to using technology. With tons of children now using tablets as learning/reading devices, getting your kid familiar with how electronics work is becoming more and more important. 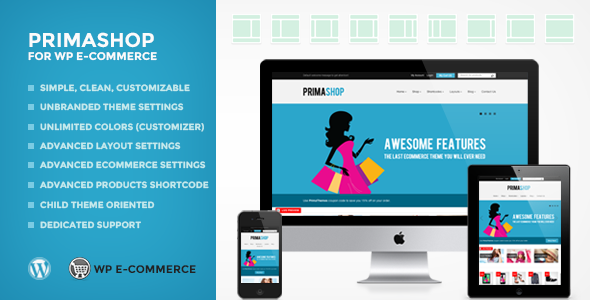 Primashop is a clean, responsive eCommerce theme that isn’t specifically created for kid-themed websites, but the simplicity and easy navigation features have made it a popular choice among kid-centered ecommerce sites. Just check out Skylandersfigures.net to see what a website can achieve with this theme. 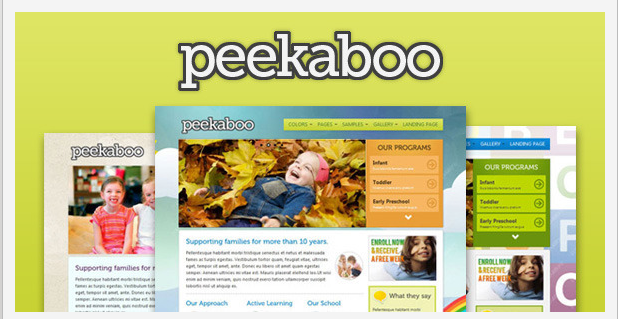 Peekaboo is a clean, bright website that comes with lots of cool plugins and features that would cost much more than the $40 that this theme comes with. It comes with the big, beautiful, and clean Nivo Slider ($29 by itself). It also includes the colorbox lightbox plugin, an easy to use shortcode editor, jQuery Tiny Carousel, AddThis widget, and a ton more features. The result is an easy to customize site that is perfect for any child-based business website. The top three picks on this list are all premium e-commerce themes, but that’s because they are professionally designed and have lots of cool features that will save you a lot of time when you’re setting up the website. But don’t worry, we will feature some free kids’ themes as well. 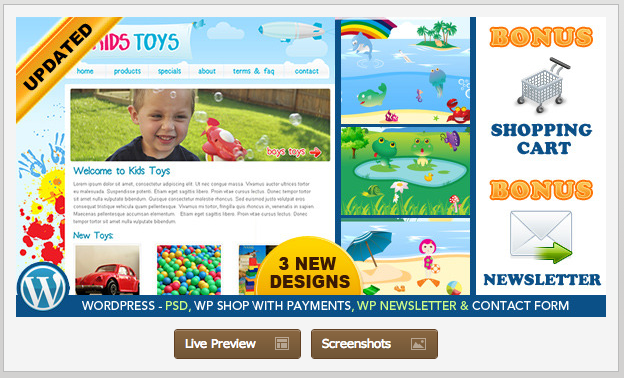 Kids Toys is another ecommerce kids theme that would look great as a child’s clothing, games, or activities e-store. it’s 100% compatible with Woocommerce, and also includes an easy to set up newsletter and contact form to help retain your customers. 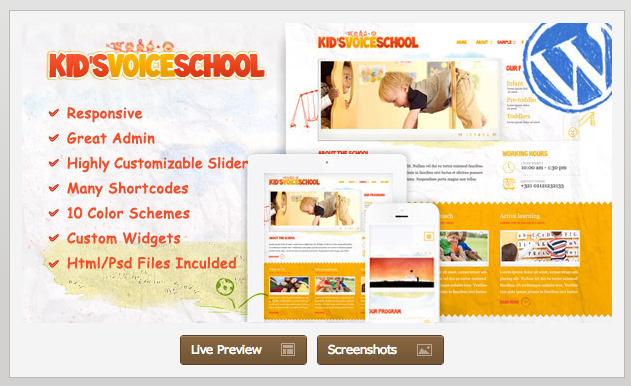 Kid’s voice school is structured more like a blog, instead of an e-commerce theme. It’s also incredibly flexible: it’s a responsive theme that will work on any device (no need to make a mobile site). It comes in 10 different color variations, as well as 11 custom widgets, and 7 different sidebar variations. It’s also SEO optimized so you can easily target keywords to rank in search engines. The great strength of this theme is the flexibility: no matter what your preference, you can shape ‘Kid’s voice school’ to your liking. Childreness is our first ‘free’ theme, although the free version comes with footer links that you can remove by purchasing the pro version for $24.95. 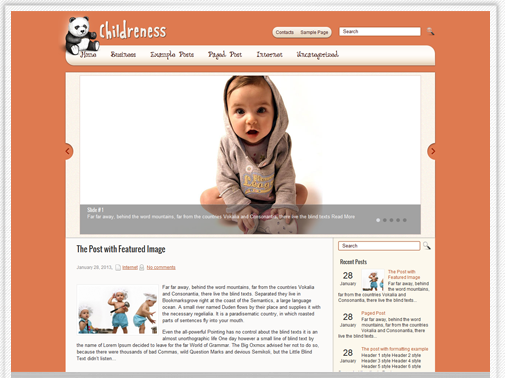 Childreness is a pretty theme: it has a giant featured image slider on the front page, as well as a custom contact form, widgets, google maps shortcode (so people can find your business), and an adorable panda on the top left. You can of course change this…but why would you ever need to? Sorry, I was ranting. The theme is also responsive and SEO-friendly. 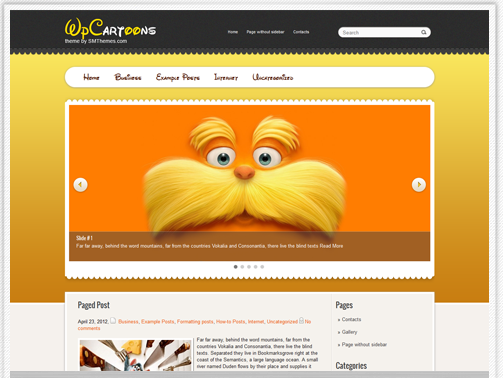 All in all a clean, simple wordpress theme for your kid-based business. If you would prefer a free theme and don’t mind footer links, this is a great theme. Alright, I’ll say it: the theme is meant to look like a Disney-inspired website. Rumor has it, kids love Disney! The theme is actually quite similar in structure and features as the Childreness theme mentioned above, but looks more Disney-fied. Whereas Childreness could function as a baby-toddler type website, this theme would suit a target demographic of kids in the Lego Star Wars/Skylanders age group. There’s been a huge upsurge in popularity of ‘mommy blogs’: websites created by mothers who share tips, ideas, and thoughts about raising kids. The blog comes with 10 header graphic configurations for you, or you can upload your own graphics if the accompanying graphics don’t fit with your brand. There’s also 2 color options, as well the ability to change the ‘sky color’ on your website. There’s also 8 customized widgets, (including a pregnancy counter!). You can use the theme purely as a blog, or you can easily add an e-commerce feature using Jigoshop.